As spring turkey season draws near, I, like many turkey hunters, find myself wanting to refresh my turkey hunting skills and add to them for the upcoming season. I found just the right book for the job. It is John Trout Jr.'s new book, The Complete Book Of Wild Turkey Hunting  A Handbook of Techniques and Strategies. 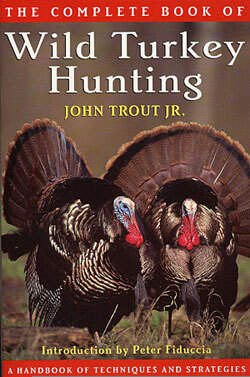 Unlike many other books, Trout's book does not spend a lot of time on calling but instead covers hunting methods. Most turkey hunters know that every situation can be different and that is what makes this book great. There are chapters on Preseason Strategies, The Ambush Location, Working Sunrise Gobblers, Boss Birds vs. Bachelor Groups, Hung Up or Call Shy, Public-Land Gobblers, Double-Teaming Turkeys and more. Like many of us, I find my time limited so when I pick up a book it needs to be on a subject that I am interested in and has to catch my attention and hold it in order for me to finish it  this one did just that. I read a number of things that I want to try this season and it also made me think of some hunting situations I wish I could do over. A very interesting item I learned from the book is that "biologists claim that one in 20 hens has a beard." For California hunters the regulations state that you can take a turkey with a visible beard. This season you just may find that gobbler is really not a gobbler  but legal nonetheless!